Robby Gallaty’s life was radically changed from drug-dealer to the pastor of a growing church. He credits the transformation not only to his conversion experience, but also to the process of personal discipleship he enjoyed under David Platt and others. His book, Growing Up: How to Be a Disciple Who Makes Disciples, shares his passion for discipleship that he is living out as pastor of Brainerd Baptist Church in Chattanooga, Tennessee. Gallaty gives a strong Biblical argument for the need for discipleship. The focal point of his book is the suggestion that instead of depending on Sunday School classes to do discipleship, churches should have small, closed discipleship groups with a leader and 3 or 4 other people of the same gender. He uses the name “D-group” for such discipleship groups. He prefers such small groups over discipleship by one-on-one mentors, saying one-on-one mentoring is harder to reproduce and may turn into a counseling relationship instead of a discipleship process. While he gives good reasons for the D-group, he seems to overstate the case that his is the best way. After all, Gallaty himself was mentored one-on-one by David Platt, while Jim Putnam’s book, Real-Life Discipleship, describes some effective discipleship with small groups that are larger than the size that Gallaty suggests. 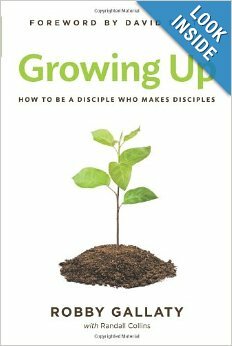 Nevertheless, Growing Up is a useful resource for church leaders wishing to get serious about discipleship. The book is filled with practical advice about growing in one’s prayer life, Bible study, evangelism, and discipling others. Gallaty is fond of acronyms. The last six chapters of his book form the acronymn for the discipleship process: “CLOSER” which stands for Communicate, Learn, Obey, Store, Evangelize and Renew. He suggests the “HEAR” method of Bible study: Highlight, Explain, Apply and Respond. He says the D-group needs “FAT” belivers: Faithful, Available and Teachable. While I would argue that D-groups are not the only way to do it, the fact remains that Gallaty is actually leading his church to do something, rather than just talk about it. I would highly recommend Growing Up as a resource that church leaders can use to implement true discipleship in their churches. It is “REAL” (Realistic, Easy to Read, Applicable, and Life-changing). In the interest of full disclosure, let me state that I received a free copy of this book for review, but I was under no obligation to write a positive review. If you see a video ad below this post, please understand that I have no control over the content in these ads, and I do not necessarily endorse the product. Posted on November 28, 2013, in Books, Christian Living and tagged book, books, Christian growth, Christian living, disciple, discipleship, faith, Gallaty, religion. Bookmark the permalink. Leave a comment.